Spring is a time for growth and rebirth, so what better time to jump into a new, exciting project? So here’s mine: I just joined the Disney Driven Life (http://thedisneydrivenlife.com) as one of their 60 bloggers–get this, the Fine Arts blogger. See, Dad, you CAN do something with an English major/fine arts degree (haha)! 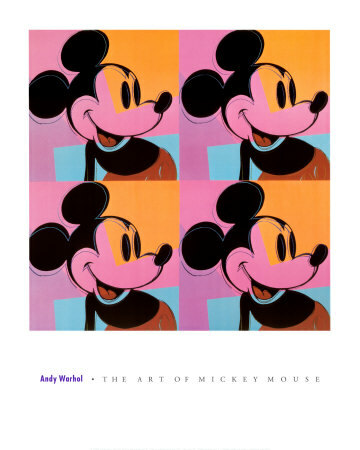 So what better way to commemorate my Fine Arts blogger status than to include the Andy Warhol print, “The Art of Mickey Mouse.” Well, I like it: it’s colorful, bold, and has Mickey on it, so what’s not to like? By the way, I get to write on more than just artwork. Just sayin. Anyway, you hopefully get my drift and will also jump over there and check me and the other NDP’s (neurotic Disney people) out! And join! And post comments! Because I know I’m not alone in my Disney enthusiasm, people. Previous My Saturday Next Happy Mother’s Day!